This book compiles a series of articles that aim to give an overall view of the main population characteristics of the most important target species of the demersal fishery along the European coasts of the Mediterranean Sea. The volume is structured in two main sections, in addition to an introductory chapter and a series of appendixes: the first main section is based on the presentation of the spatial and temporal tendencies of the abundance in number and biomass and of the population structure of the main target species; the other is devoted to free contributions on the ecology and biology of exploited demersal ecosystems and species in the Mediterranean Sea. 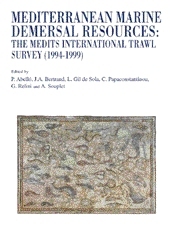 It is based on the results of a time series of demersal trawl surveys (1994-1999), the MEDITS surveys, financed by the European Commission DG XIV. Many institutions and researchers from many Mediterranean countries, not only from those belonging to the European Union, have contributed with their standardised surveys to compile this information: Morocco, Spain, France, Italy, Slovenia, Croatia, Albania, Greece, and Malta. The series did not stop in 1999, but is still today (2002) still alive and increasing its data base which indubidably is, and hopefully will still be, very useful not only to fishery managers, but also to biologists, ecologists, bioeconomists and sociologists for many years.